Purchased with the assistance of the Story Fund, 2000. A four-panel screen embroidered in silk in a lacquer and calamander-wood frame. The scene is of cormorant-fishing by night, with birds perched on a boat with burning braziers at either end. Inscribed on a copper plaque: Iida & Co. ‘Takashimaya’ Kyōto, Tōkyō, Yokohama. The composition of the screen follows the left hand of a pair of screens by Takeuchi Seihō (1864-1942), now in the Ōshajō Museum, Hiroshima (Ōshajō Bijutsu Hōmotsukan Shōzō). Seihō had spent some time in Gifu in the late nineties observing and sketching the cormorant fishing, and some of the sketches, including some for the original of this screen, are in Kyōto City Art Museum. Seihō was an admirer of Turner and had read much of Ruskin’s work; he visited Europe more than once and was present at the Paris Exposition of 1900. Shinshichi Iida founded the Takashimaya Iida Company as a clothing store in Kyōto in 1831, and by 1909 it was a major store with several outlets in Japan. In 1930, the corporate name was changed to Takashimaya Co. Ltd, the name it retains today. 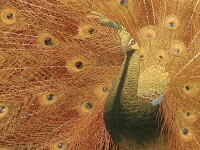 Seihō acted as chief designer for textiles, including cut-velvet and needlework, though the company also used other artists. 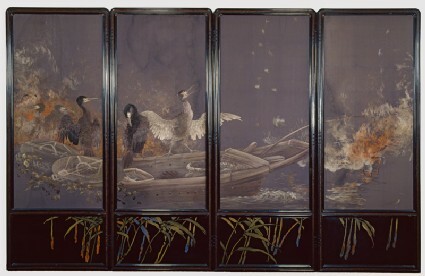 The lacquered wooden frame and lower panels are closely similar to a screen by the same company exhibited at the Japan-British Exposition at Shepherd’s Bush in London in 1910 (Cat. No. 237) depicting flowers in the style of Sōtatsu. The company exhibited a screen ‘with a dark ground’ at Liège in 1906, but we do not know the subject-matter. Might it have been this?